Real Sociedad visit San Mamés for a battle with Athletic Club, the first Basque derby for new coaches Eduardo Berizzo and Asier Garitano. Athletic Club and Real Sociedad, hailing from Spain’s northern Basque Country region, are among the most historic teams in LaLiga Santander. Between them they have 10 LaLiga titles (eight for Athletic, two for Real Sociedad), making them two of just nine teams to ever win the league championship. Today both sides maintain very realistic European ambitions. They both qualified for the Europa League in 2016/17, only to then finish outside the top half of the table in 2017/18 and are looking to return to continental competition this year under new coaches. This summer Athletic hired Eduardo Berizzo while Real Sociedad brought in Asier Garitano. This will be their first derby, an experience they’ll surely never forget. It’s a derby like no other, so what’s at stake? For both coaches, the three points are vitally important. These two teams have had inconsistent starts to their respective seasons and a victory would be most welcome. While the overall goal for these clubs this season is to qualify for Europe, there is also an immediate objective which is simply to get one over their historic rivals. Put simply, derbies always matter, regardless of table standings. The derby really burst into life in the 1980s, when between them these sides took home the first four league titles of the decade. La Real were triumphant in 1980/81 and 1981/82, while the LaLiga trophy headed to Bilbao in 1982/83 and 1983/84. Funnily enough, both of them actually clinched a league title in a Basque derby. On the final day of the 1981/82 season, Real Sociedad needed a victory at home to Athletic in order to guarantee the league title and that’s exactly what happened thanks to decisive goals from Jesús María Zamora and Roberto López Ufarte. Two years later, in 1984, Athletic won the league title with a 2-1 derby day victory on the final day with Iñigo Liceranzu’s brace helping them to finish just above Real Madrid. The rivalry has seriously been ramped up over the past year. Athletic Club’s January purchase of star Real Sociedad centre-back Iñigo Martínez by triggering his release clause did not go down well in San Sebastián, nor did the reports in the summer of Athletic’s interest in Mikel Oyarzabal, La Real’s promising 21-year-old forward. Given that Athletic Club only field Basque players, it’s logical that they’ll often try to sign talent from Real Sociedad, who don’t have a Basque-only policy but still maintain a strong Basque core. That said, this is generally a friendly derby. This isn’t a derby of hatred; it’s more like a brotherly rivalry. For that reason, it’s very common to see a mix of supporters in the stands, with some members of a family donning the red and white of Athletic, while the others wear Real Sociedad’s blue and white. Games take on a true festival feel. As two of the founding members of LaLiga, Athletic Club and Real Sociedad are two of the most respected and heralded institutions in Spanish football. Over the years they have built up large fanbases not only in the Basque Country and across Spain but throughout the world too. With official supporter groups stretching from California, USA to London, UK, it's easy to see how this is a derby that extends far beyond the borders of the Basque Country and why it has become one of the most-watched fixtures of the LaLiga season. 1. Iñaki Williams. The Athletic winger is a perennial danger thanks to his extreme pace and his ability to beat defenders. He has scored in two previous derbies against Real Sociedad, both of which ended with wins for his team. 2. Mikel Oyarzabal. The man from Eibar is Real Sociedad’s response to Williams. Aged just 21, he scored 12 LaLiga Santander goals last season, including one against Athletic, and assisted seven more. Away from football, he balances his time studying for a Business degree at the nearby University of Deusto. 3. Iñigo Martínez. The Spain international centre-back spent his entire career with Real Sociedad until switching his allegiances by joining Athletic midway through last season. He’ll be taking part in his 15th derby, his second with Athletic. 4. Asier Illarramendi. The Real Sociedad captain bleeds blue and white and loves nothing more than seeing his team get one over their rivals. He played in his first Basque derby in 2011 and remains just as passionate about this fixture seven years on. 5. Dani García. The midfielder came through Real Sociedad’s academy before making a name for himself as club captain at Eibar. He joined Athletic in the summer and will be desperate to face La Real, having missed Eibar’s two fixtures against the San Sebastiánites through suspension last year. 1. This is one of the very oldest fixtures in LaLiga Santander history, as they met in the opening round of the inaugural LaLiga season in 1929, with the match finishing as a 1-1 draw. 2. Both clubs sealed a league championship in a Basque derby. In 1981/82, Real Sociedad defeated their rivals on the final day of the season to secure the title ahead of Barcelona, before the opposite happened two years later when an Athletic victory helped them finish above Real Madrid. 3. Athletic and La Real are two of just nine teams to have ever won the LaLiga Santander title. 4. 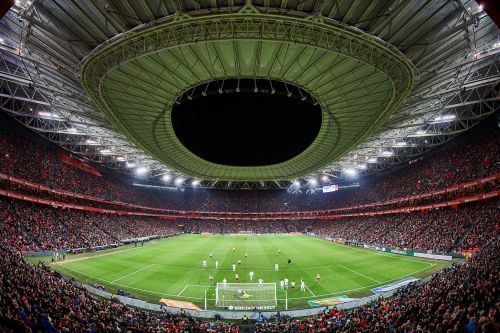 Since Athletic opened their new San Mamés stadium in 2013, the teams have been equally matched in derbies there. Both teams have won on one occasion, while there have also been three draws. 5. These two coaches have faced each other on three occasions when Garitano was in charge of Leganés, with Berizzo winning two of these matches – once with Sevilla and once with Celta Vigo. Garitano’s Leganés beat Berizzo’s Celta side in the other meeting.